In August 1986, the Westland Lynx claimed the official world airspeed record for helicopters: 400.87 km/h or 249.10 mph. It is generally accepted that the speed recorded is probably approaching the limit achievable with a conventional helicopter. 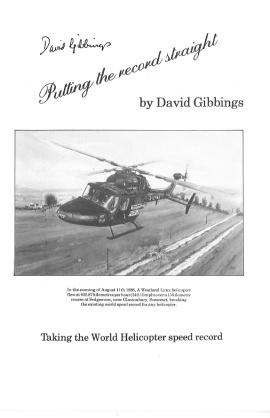 This 20 page booklet – written by the then-Deputy Chief Flight Test Engineer for Westland (now AgustaWestland) – details the efforts leading up to the record attempt. Brief statements by Geoff Byham, the chief engineer responsible for the British Experimental Rotor Programme (BERP) blade program, and John Perry, the chief aerodynamicist, explain how the aircraft was prepared for the task. More than 30 years has passed since the official world record was established and remains unbroken by any other pure helicopter. Publisher: Picton Publishing (Chippenham) Ltd.